The Ship/Submarine Recycling Program (SRP) is the process that the United States Navy uses to dispose of decommissioned nuclear vessels. SRP takes place only at the Puget Sound Naval Shipyard (PSNS) in Bremerton, Washington, but the preparations can begin elsewhere. In this image, the superstructure of Virginia has been replaced with containment structures to remove nuclear fuel before entering SRP. Before SRP can begin, the vessel's nuclear fuel must be removed, and defueling usually coincides with decommissioning. Until the fuel is removed, the vessel is referred to as "USS Name," but afterward the "USS" is dropped and it is referred to as "ex-Name." Defueling of submarines is carried out at only five ship repair facilities on the West Coast, and the hulls are then towed to PSNS. Reusable equipment is removed at the same time as the fuel. 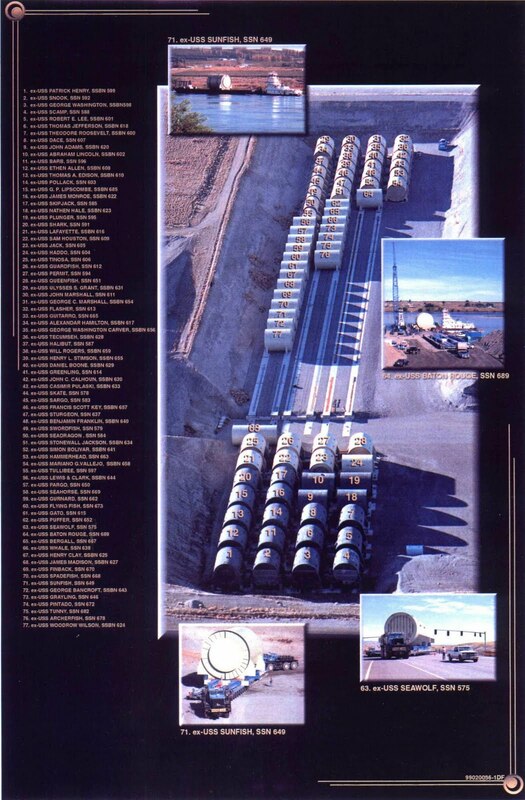 Spent nuclear fuel is shipped by rail to the Naval Reactor Facility in the Idaho National Laboratory (INL), located 42 miles (68 km) northwest of Idaho Falls, Idaho, where it is stored in special canisters. At PSNS the SRP proper begins. The salvage workers cut the submarine into three or four pieces: the aft section, the reactor compartment, the missile compartment if one exists, and the forward section. Missile compartments are dismantled according to the provisions of the Strategic Arms Reductions Treaty. Until 1991, the forward and aft sections of the submarines were rejoined and placed in floating storage. Various proposals for disposal of those hulls were considered, including sinking them at sea, but none was economically practical. All required removal of the numerous polychlorinated biphenyl products (PCBs) on board, which are considered hazardous materials by the Environmental Protection Agency and United States Coast Guard. Since then, and to help reduce costs, the remaining submarine sections are recycled, returning reusable materials to production. In the process of submarine recycling, all hazardous and toxic wastes are identified and removed, reusable equipment is removed and put into inventory. Scrap metals and all other materials are sold to private companies or reused. The overall process is not profitable, but does provide some cost relief. Disposal of submarines by the SRP costs the Navy US$25-50 million per submarine. Once the reactor compartment is removed, it is sealed at both ends and shipped by barge and multiple-wheel high-capacity trailers to the Department of Energy's Hanford Nuclear Reservation in Washington state, where they are currently, as of 2016[update], kept in open dry storage and slated to be eventually buried. Note that Russian submarine reactor compartments are stored in similar fashion near Murmansk. The burial trenches have been evaluated to be secure for at least 600 years before the first pinhole penetration of some lead containment areas of the reactor compartment packages occurs, and several thousand years before leakage becomes possible. In 1959 the US Navy removed a nuclear reactor from the submarine USS Seawolf and replaced it with a new type. The removed reactor was scuttled in the Atlantic Ocean, 200 km (108 nmi) east of Delaware, at a depth of 2,700 m (8,858 ft). In 1972, the London Dumping Convention restricted ocean disposal of radioactive waste and in 1993, ocean disposal of radioactive waste was completely banned. The US Navy began a study on scrapping nuclear submarines; two years later shallow land burial of reactor compartments was selected as the most suitable option. In 1990, USS Scamp was the first US nuclear-powered submarine to be scrapped. By the end of 2005, 195 nuclear submarines had been ordered or built in the US (including the NR-1 Deep Submergence Craft and Virginia, but none of the later Virginia class). The last of the regular Sturgeon attack boats, L. Mendel Rivers, was decommissioned in 2001, and Parche, a highly modified Sturgeon, was decommissioned in 2004. The last of the initial "41 for Freedom" fleet ballistic missile (FBM) submarines, Kamehameha, was decommissioned in 2002. Decommissioning of the Los Angeles boats began in 1995 with Baton Rouge. Additionally, a handful of nuclear-powered cruisers have entered the program, and their dismantling is ongoing. The first aircraft carrier due for decommissioning that would enter the SRP is planned to be Enterprise, which was withdrawn in 2013. Hulls waiting or already processed by the recycling program are listed below. † A dagger after a completion date indicates that portions of the hull were preserved as memorials. See the individual articles for details. (note) ex-Long Beach has been partially dismantled and remains moored in Puget Sound Naval Shipyard in 2018. Some of these submarines (the George Washington class) were fleet ballistic missile boats for the vast majority of their careers. However, they were briefly converted to SSNs before decommissioning and arrival at PSNS, and so are listed under that designation here. ‡ Date given for ex-Parche is official date used to secure FY2004 funding; work did not begin until 19 October. La Jolla (SSN-701) is currently undergoing conversion to a moored training ship at Norfolk Naval Shipyard. San Francisco (SSN-711) will be converted after decommissioning. Some of these submarines (the Lafayette class) were fleet ballistic missile boats for the vast majority of their careers. However, they were converted to SSNs for use as moored training platforms and are not currently scheduled for recycling. Because the program is underway, this list is almost certainly incomplete. Note for ships marked with refit: Sam Rayburn (SSBN-635) was converted into a training platform — Moored Training Ship (MTS-635). Sam Rayburn arrived for conversion on 1 February 1986, and on 29 July 1989 the first moored training ship achieved initial criticality. Modifications included special mooring arrangements including a mechanism to absorb power generated by the main propulsion shaft. Daniel Webster (SSBN-626) was converted to the second Moored Training Ship (MTS-2 / MTS-626) in 1993. The Moored Training Ship Site is located at Naval Weapons Station Charleston in Goose Creek, South Carolina. Sam Rayburn is scheduled to operate as an MTS until 2014 while undergoing shipyard availabilities at four-year intervals. ^ "End Points for Spent Nuclear Fuel and High-Level Radioactive Waste in Russia and the United States". National Academies Press. 2003-06-01. Retrieved 2013-02-11. ^ "Submarine reactor compartments at Hanford". Retrieved 2012-08-02. ^ "Trimming the Submarine Fleet". americanhistory.si.edu. ^ "Google Maps". Google Maps, Hanford, Washington. ^ Nilsen, Thomas. "Last three reactor compartments soon off the water". The Barents Observer. Retrieved 15 October 2018. ^ "Sayda, Murmansk Oblast, Russia". Google Maps. ^ "Dismantling Nuclear Submarines". U.S. Nuclear Weapons Cost Study Project. Brookings Institution. Retrieved 2012-08-02. ^ "Submarine Centennial Chronology". Navy.mil. Archived from the original on 2012-10-06. Retrieved 2013-02-09. ^ "Nuclear fuel from Enterprise headed for Idaho". Navy Times. Retrieved 2013-02-11. ^ "Draft Environmental Assessment on the Disposal of Decommissioned, Defueled, Naval Reactor Plants from USS ENTERPRISE (CVN 65), September 2011". Retrieved 2014-04-28. ^ a b c d e f g h i j k Morison, Samuel Loring (December 2006). "U.S. Naval Battle Force Changes". Proceedings of the Naval Institute. 132 (12): 59–60. ISSN 0041-798X. ^ a b c d e f g h i j k l m n o p q r s t u v w x y z Morison, Samuel Loring (May 2007). "U.S. Naval Battle Force Changes". Proceedings of the Naval Institute. 133 (5): 111. ISSN 0041-798X. ^ Morison, Samuel Loring (May 2010). "U.S. Naval Battle Force Changes 1 January 2009 – 31 December 2009". United States Naval Institute Proceedings. 135 (5): 112. 0041-798X. ^ a b c d e f g h i j k l m n o "USS Dallas completing 36-year-run in Bremerton". ^ "USS Cincinnati reactor compartment comes to Hanford". ^ "Defense Logistics Agency > News > Images". www.dla.mil. ^ "A nuclear sub in the desert? Parts of the USS Phoenix await permanent home". ^ "Navy Swaps Dallas, Norfolk Inactivation Dates". US Navy News Service. May 30, 2014. ^ Copeland, Kevin (11 December 2014). "USS Norfolk Decommissioned". US Navy News Service. ^ "Submarine USS Buffalo Arrives in Washington for Decommissioning". ^ "Ships, Both Coasts, Disposed". Nvr.navy.mil. Retrieved 2013-02-09. This page was last edited on 24 November 2018, at 07:21 (UTC).